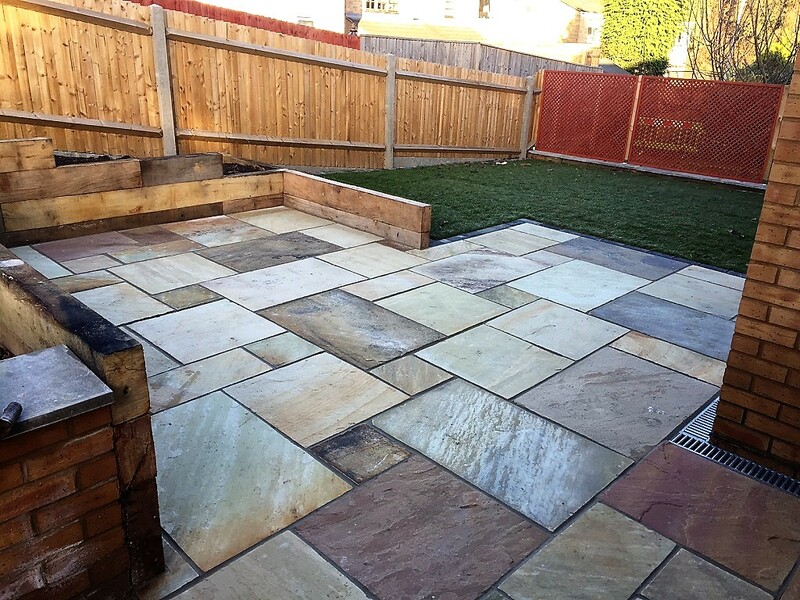 Landscaping services Home » News/Blog » Landscape project, our latest - final front and back garden photos. 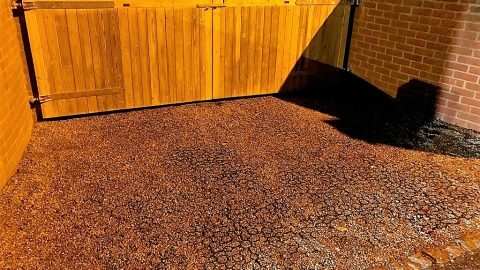 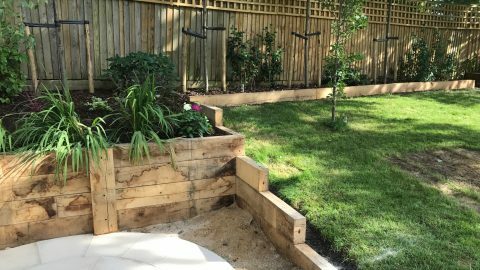 We posted about our latest and final landscape project in 2016. 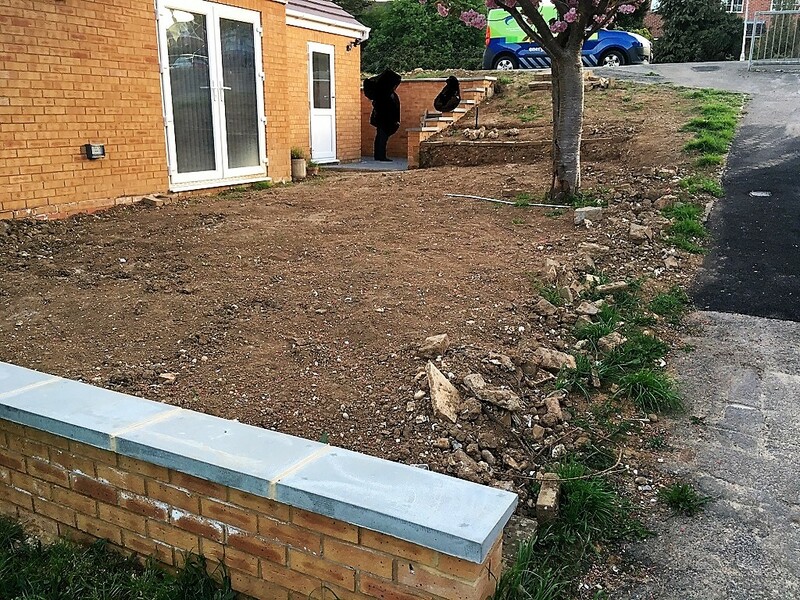 This is to show you what has changed at the front and back of the house. 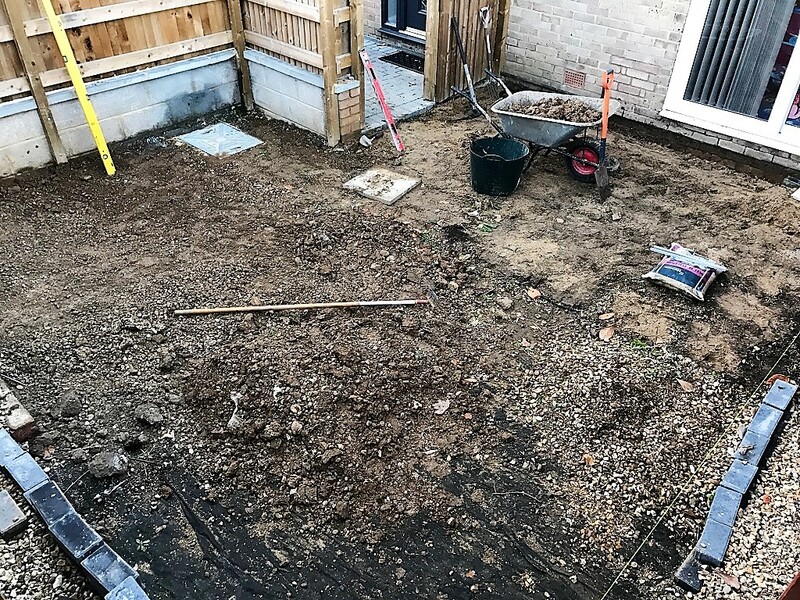 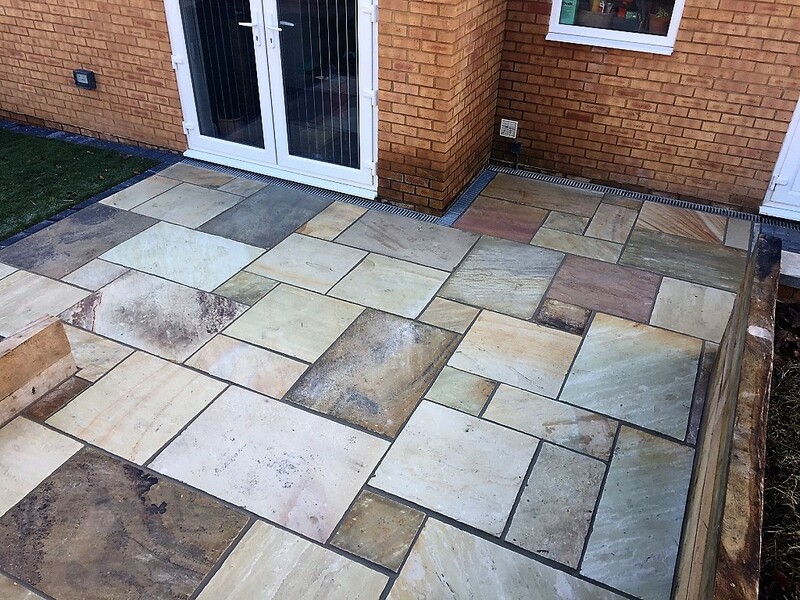 At th front: This small, mainly muddy, uneven area with some grey concrete slabs laid loosely has seen a bit of improvement..
As discussed and agreed on the layout with a customer, we kept it simple. 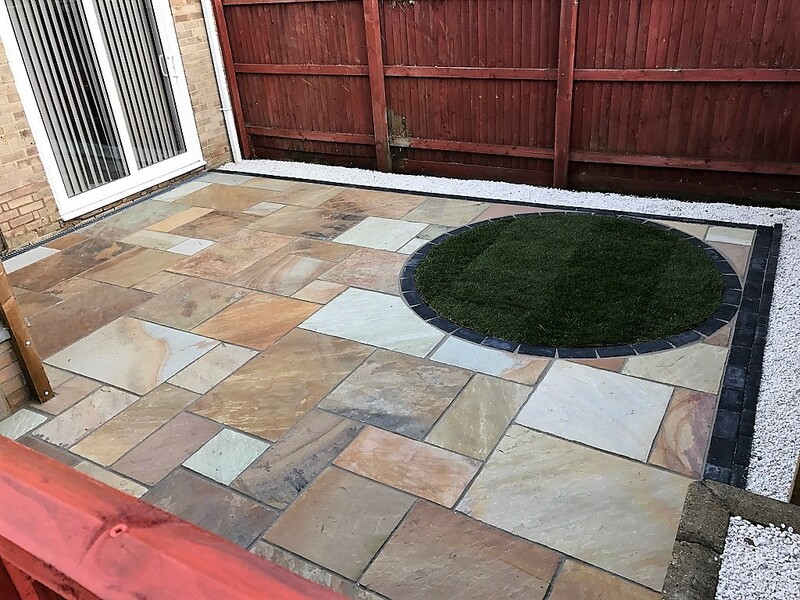 Neat and easy to maintain. 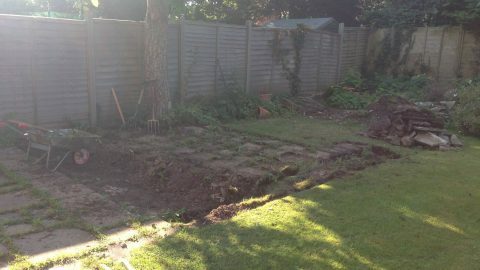 We did not want to just pave it over, even though area in question is only 20m2 and mainly shady. 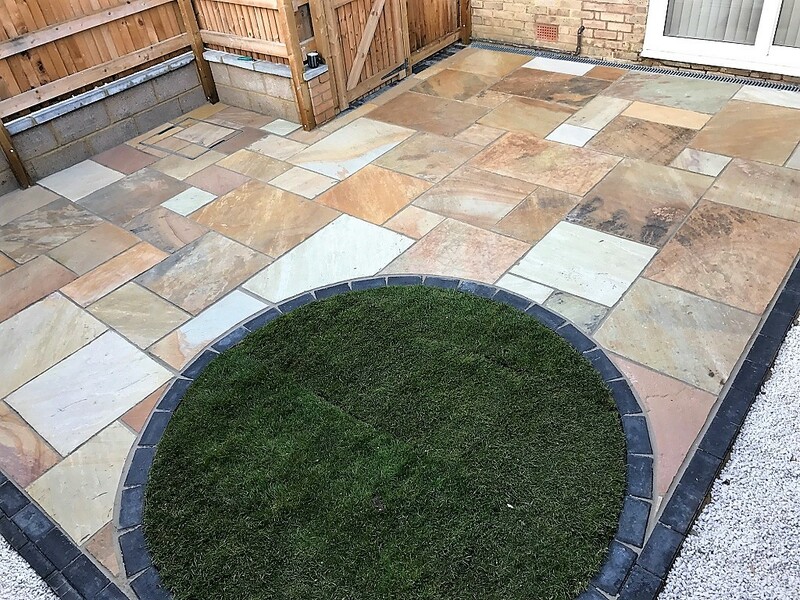 What we have done is of course pave it with nice sandstone flags ( all draining towards a new channel drain laid along the house ) but also incorporate into this landscape a bit of life, a bit of greenery.. so a small round lawn area was made. 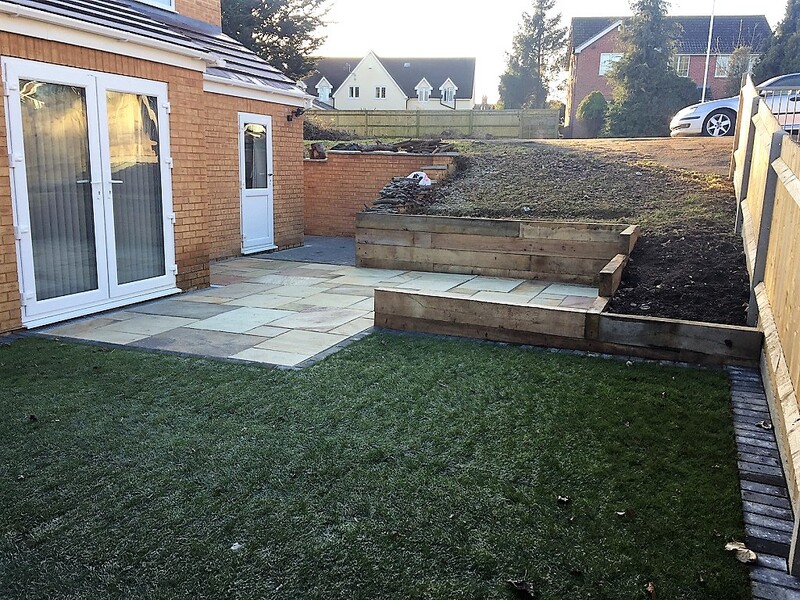 Simple yet we think a thought-through and a good looking landscape. 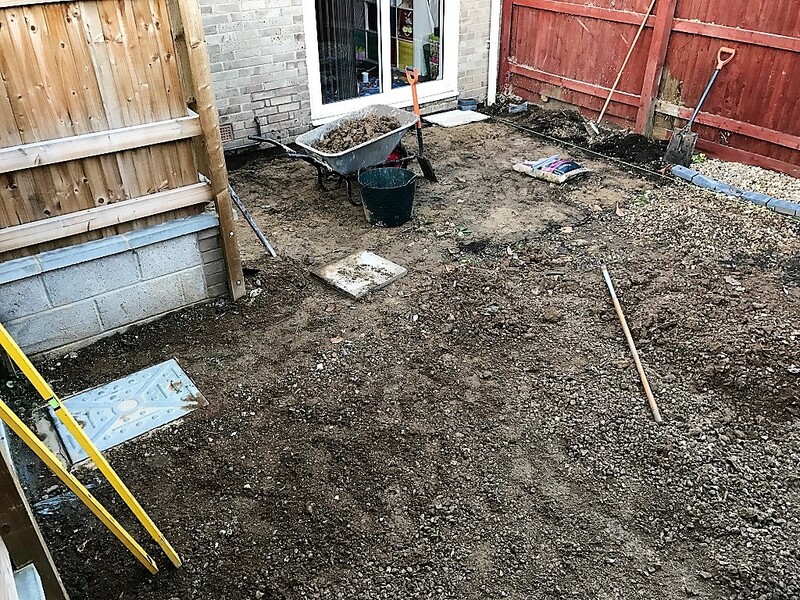 Back garden did get some landscaping make over as well..
New fence, brick edging along the perimeter, soil improved and new turf laid, new patio, draining channels and wooden retaining wall. 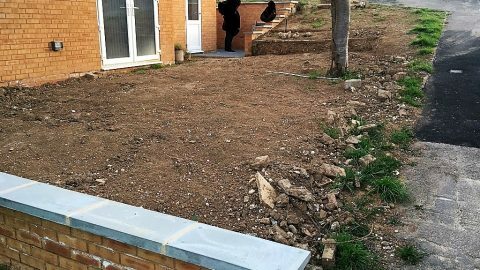 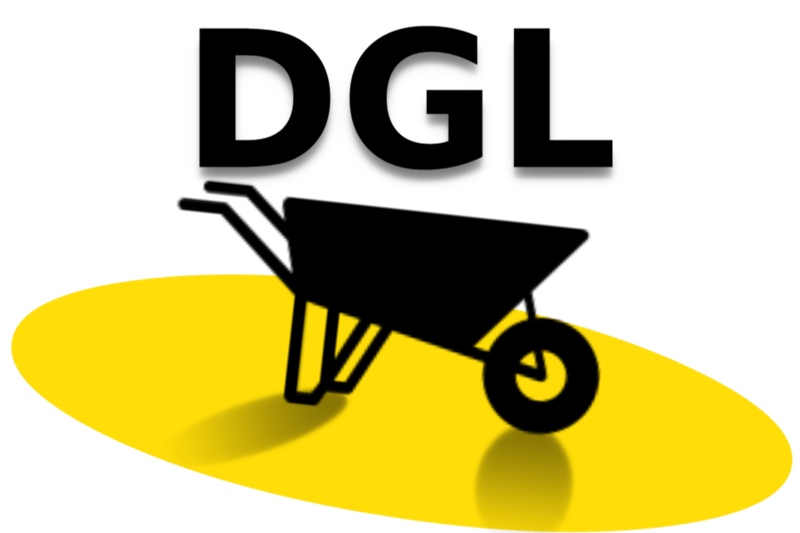 There's still areas around that could do with some help but due to financial restraints we have been asked to do them at a later stage. 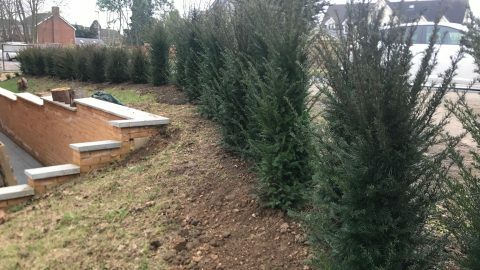 Latest landscaping project in Caversham. 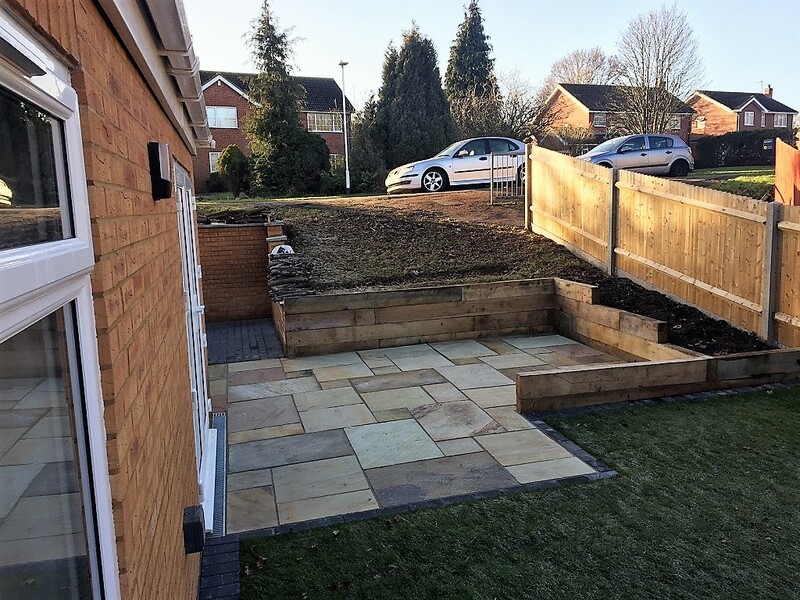 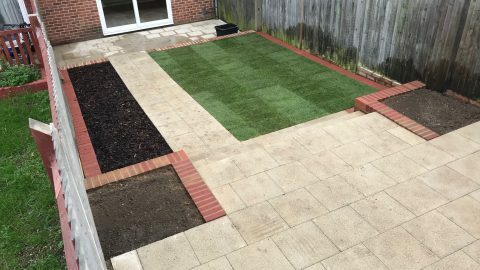 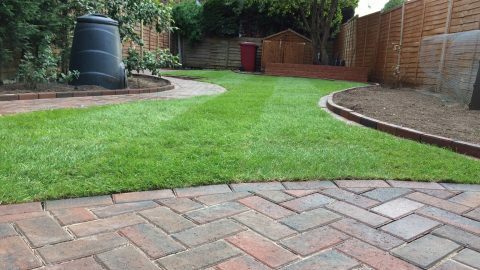 December 2016Landscaping in Wokingham. 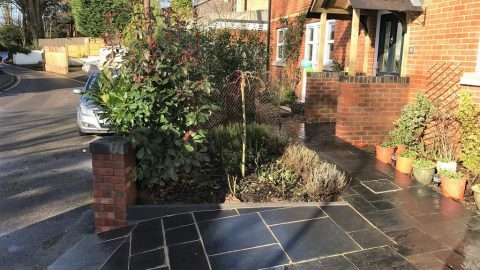 Driveway extension and porch.